Blame JP, who asked me to put together a poster on behalf of Osmosoft to celebrate the Traveling Geeks visiting BT. 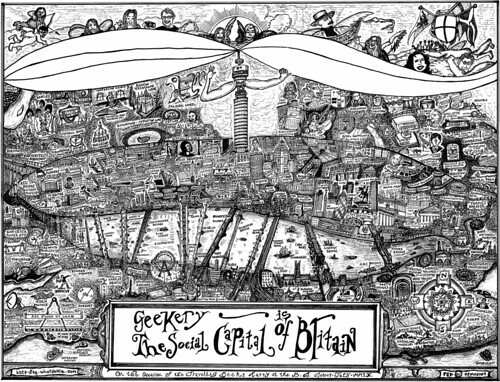 The brief was to “incorporate said geeks, BT and Cool Britannia”. After some head scratching, and a wrong turn involving The Merry Pranksters, I landed on this attempt at a John Norden map of things which might interest a geek visiting Britain, seen from the perspective of the BT Tower. The original plan was to have copies to hand out at the event, but after leaving it up until the wire, and a saga involving a taxi dash and two broken scanners — it’s hand drawn with pen and ink on A2 cartridge paper — we went with a photograph blown-up to B0 which the geeks signed on the night. It’s fair to say the reaction from the geeks on seeing my pathetic attempt at representing them as angels and cherubs was a little “mixed“, but what the hey, I did have fun trying! A cleaned up high scan of poster is available on flickr under the creative commons and as a PDF for print which is dedicated to the public domain, so fee free to copy, clip, mash it up however you see fit, and although it’s pure vanity to demand attribution, the odd link to this blog post would be nice! As for the locations, I’m particularly indebted to Simon Willison’s London for Geeks Google map and the lovely O’Reilly Geek Atlas which has greater depth and a wider scope, but actually no map! There are quite a few references with one or two allusions, in-jokes and random acts of love to be found in the drawing, and given the density of the picture I don’t think I’ll be able to use flickr notes to build the annotations as with my other drawings, rather I’ve a cunning plan involving Project Cecily. So watch this space! A Whatfettle article by Paul Downey published Wednesday, July 8th, 2009, at 12:01 am under a Creative Commons License.